“You radiate strength, energy, exuberance, and life force – the kind that emanates from within, giving you an energetic force field that others respond to, but within which you dwell, radiant and well. With every day, every heartbeat, ever conscious moment – including all the wise decisions you have made on behalf of your wellbeing – you are beginning to develop lasting strength, and your energy is potent, a force and a presence. 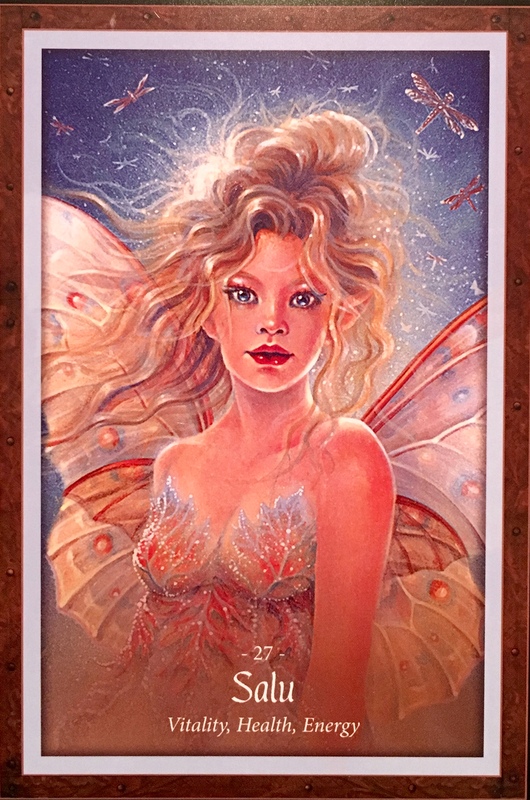 This card can also signify that it is time for you to truly take your wellbeing seriously – to connect deeply and respectfully with the body, to reshape it, reclaim it from all the cultural biases and all the voyeuristic judgments we are all subject to. It is time to develop support networks where your mind is valued, and healthy relationships are nurtured, developed, and sustained. Salu is the Divine feminine counterpart to Barnabus. She is the compliment to his masculine energy; she is whole and she is free; as she is loving and receptive. She is asking that as we show ourselves love and acceptance, she encourages us to nurture and care for ourselves, body, mind and spirit. What old habits can we release that no longer serve our Highest Good and true health? How can we shine our light more brightly? Making simple choices in our lives concerning drinking more pure water, eating fresh fruits and veggies, cutting back on packaged foods, avoiding heavy meats and processed foods can make a world of difference to our wellbeing. Releasing old habits of toxic substances and refusing to put poisons, pesticides and chemicals into our bodies can be truly transformational. This can no longer be ignored; it is crucial for our ascension. We literally must elevate our density, our vibration and our Lightness of Being. What can you change, today to make a difference to your health? It could be stress related, it could be diet, it could be that you are overdoing something. Only you know. This is personal, and it is a message just for you. Take it seriously. Release the pattern and step into a new way. Whatever it is, commit to making it a priority. You are worth it. You are starting this new chapter and there are just some things that cannot continue.